I did change up the traditional style a little by adding a few more veggies to the meat mixture, but all it does is add more flavor. Nothing wrong with that, right? I also threw in a jalapeno for a little kick but you could easily leave it out for a more mild version. 1. Saute onion, carrot and green pepper in 1 TB oil just until soft. Don't overcook. Set aside and allow to cool while you prepare the rest. 2. In a large bowl, combine all except onion mixture and sauce ingredients. Mix well. When onion mixture is cool, add to bowl and stir well, making sure everything is thoroughly incorporated. 4. 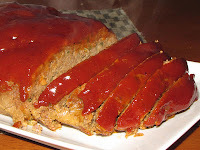 Mix sauce ingredients together and pour over meatloaf during last 15-20 minutes of cooking on high. 5. 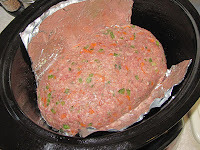 Remove the loaf from the crock pot using the foil to lift it out and transfer to a plate or cutting board. Let stand for about 10 minutes before slicing.